The horrors of the Great Famine (1315-1322), one of the severest catastrophes ever to strike northern Europe, lived on for centuries in the minds of Europeans who recalled tales of widespread hunger, class warfare, epidemic disease, frighteningly high mortality, and unspeakable crimes. Until now, no one has offered a perspective of what daily life was actually like throughout the entire region devastated by this crisis, nor has anyone probed far into its causes. 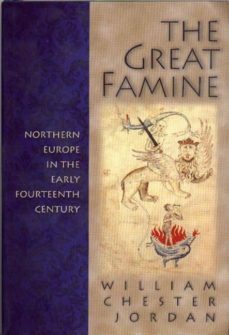 Here, the distinguished historian William Jordan provides the first comprehensive inquiry into the Famine from Ireland to western Poland, from Scandinavia to central France and western Germany. He produces a rich cultural history of medieval community life, drawing his evidence from such sources as meteorological and agricultural records, accounts kept by monasteries providing for the needy, and documentation of military campaigns. Whereas there has been a tendency to describe the food shortages as a result of simply bad weather or else poor economic planning, Jordan sets the stage so that we see the complex interplay of social and environmental factors that caused this particular disaster and allowed it to continue for so long.Jordan begins with a description of medieval northern Europe at its demographic peak around 1300, by which time the region had achieved a sophisticated level of economic integration. He then looks at problems that, when combined with years of inundating rains and brutal winters, gnawed away at economic stability. From animal diseases and harvest failures to volatile prices, class antagonism, and distribution breakdowns brought on by constant war, northern Europeans felt helplessly besieged by acts of an angry God--although a cessation of war and a more equitable distribution of resources might have lessened the severity of the food shortages.Throughout Jordan interweaves vivid historical detail with a sharp analysis of why certain responses to the famine failed. He ultimately shows that while the northern European economy did recover quickly, the Great Famine ushered in a period of social instability that had serious repercussions for generations to come.